I think there’s a rounding error and we actually have a tie. so 1% is almost certainly a rounding error. My suggestion is a new poll between the two, but I am open for other ideas too. with each entrant PM-ing their choice so the choices remain secret. The only advantage is it’s the least time consuming solution as long as both entrants are currently online. A poll would work too, but if there’s a time limit then naturally some people are going to miss out on voting. Do you remember how many registered users there were at that time? No, but I can probably find out with a bit of digging. No need. Does not really matter. I had a quick look anyway. but I found the number of unique user visits, which is probably good enough. For the week the Arduboy poll was open, unique user visits averages at 66 unique visits. For the two days our Python jam poll has been open, unique user visits averages at 29 unique visits. so statistically speaking we’re doing as expected. If both @bl_ackrain and @dir3kt are both available now then the rock-paper-scissors solution is an option. Alternatively the judges could just vote. @bl_ackrain and @dir3kt, are you here? Which do you prefer? RPS or a poll? First person of the tied winners to write rock-paper-scissors for the Pokitto wins! 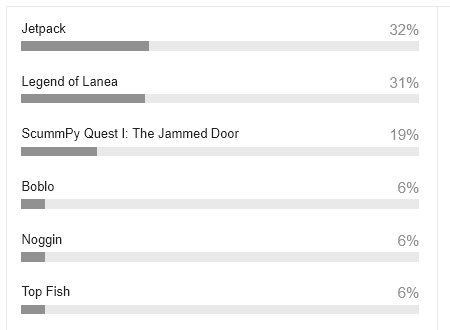 I will make a new poll between Jetpack and Legend of Lanea. Ok here it is (sorry @bl_ackrain). result = "PLAYER 1 WIN!" result = "PLAYER 2 WIN!" the rest of the games did not get winner votes. Wait a minute, if @bl_ackrain liked that post then there was a point you were both here and we could have done the rock-paper-scissors thing. i’am ok with whatever @Hanski 's decision.